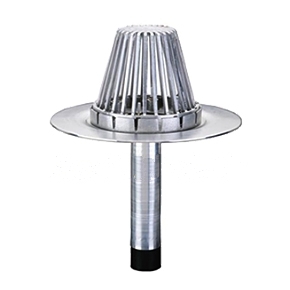 PRODUCT: 4" Hercules RetroDrain, 4" output, with Cast Aluminum Dome, 17-1/2" diameter base flange, 12" long drain stem. All Aluminum Construction. Price/Drain. Retrofit drain. Drain stem fits into a 4" ID pipe and seals using a screw tighted plug / rubber seal. U-flow mechanical seal requires U-Flow screwdriver, not included. RetroDrains are designed to replace existing drains in reroofing applications. Installed from the roof surface, the RetroDrains are engineered to be installed without removing the existing plumbing or fixture while providing a watertight connection to the roof system and the existing plumbing. Seal provides a mechanical watertight connection to PVC or cast iron pipes. 4 inch Aluminiator, all Aluminum Retrofit Drain. ProSeal Rubber Seal, 16 inch diameter .081 Gauge Spun Aluminum Base, Aluminum Clamp Ring, 10 x 4-5/8 3 Bolt Aluminum Strainer Dome, 12 inch long Outlet fits into 4 inch Drain Pipes. Price/Drain. U-Flow Screwdrive, 12-1/2 long screwdriver with square-socket end (#2 Robertson, #2 square drive) for installing OMG U-Seal Drains. Price/Each.